With healthcare organisations now entering the digital era, an extreme makeover of their information systems is mandatory, says IDC. IT security remains the greatest concern for healthcare CIOs in the Middle East and Africa (MEA) market. This is according to a recent IDC recent survey: "MEA Healthcare Going Mobile: CIO Summit Survey Highlights" which says there is currently a surge of mobile technology deployments in the region. The report examines the IT challenges across the healthcare vertical in the MEA region. IDC says based on the future mobility implementations being planned, activity will remain strong - with enterprise mobility penetrating over 80% of MEA healthcare organisations by 2017. The majority of the surveyed IT leaders identified insider threats and staff-related issues as their most critical security challenges. These concerns are being further aggravated by insufficient budgets, lack of mature security strategies, and a shortage of skilled IT security personnel, says IDC. Concerns around reliability, performance, and security of mobile systems and networks are the main challenges for widespread adoption of mobile solutions in MEA healthcare, says Nino Giguashvili, lead research analyst for Central Europe, Middle East and Africa at IDC Health Insights. "The need for a mobile healthcare workforce will be one of the key drivers of mobile technology investments in MEA over the coming years." In line with the rapidly rising importance of enterprise mobility within the MEA healthcare industry, mobile security will dominate investments in IT security solutions. Investments in mobile device management solutions will see particularly strong growth, says Giguashvili. 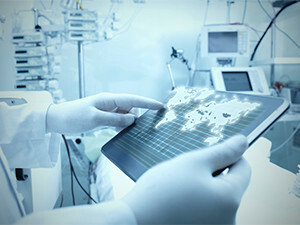 Gregory Anderson, country manager, Trend Micro SA, points out security in the healthcare industry needs to become a priority - until this happens, he fears cyber criminals will take advantage of any easy target or holes in security they come across. He urges healthcare organisations to ensure they have the best security solutions in place. Research firm Ponemon says healthcare IT leadership needs to keep a pragmatic, data-driven view of the types of security attacks they're facing, and allocate their IT security budgets accordingly. According to Silvia Piai, Europe, Middle East and Africa research manager at IDC Health Insights, with healthcare organisations now entering the digital era, an extreme makeover of their information systems is mandatory. "The extended and collaborative work environment enabled by eHealth solutions is a potential threat for security; in turn, security is a condition determining success in the uptake of these solutions."